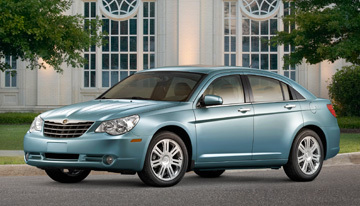 Chrysler began offering all-wheel drive on the Sebring and Dodge Avenger in late 2007, but the option really never caught on with consumers. Chrysler LLC will drop the all-wheel-drive option for the ’09 model Chrysler Sebring and Dodge Avenger midsize sedans and Dodge Caliber small car, a company spokesman confirms. The auto maker began offering AWD on the Sebring and Avenger in late 2007, but the option really never caught on with consumers, says spokesman Jiyan Cadiz. Cadiz was unable to provide the Caliber’s AWD take rate. Ward’s data shows an ’08 model take rate of 4.4% through April. Cook also says BorgWarner has heard comments that Jim Press, Chrysler president and vice chairman, was “puzzled” why AWD was offered on the trio of vehicles. But Paul Lacy, director-technical research at consulting-firm Global Insight, argues Chrysler’s decision may indicate a future trend away from AWD as high gasoline prices drive consumers toward more fuel-efficient cars and cross/utility vehicles. Lacy estimates today’s AWD systems degrade fuel economy between 2.0% and 10.0%. “New AWD systems coming on line could change that, but if a manufacturer is struggling to meet the new fuel-economy targets, you won’t see a lot of added content from them out of the gate,” he says. Pending corporate average fuel economy regulations, which call for light-vehicle fleets to achieve 35 mpg (6.7 L/100 km) by 2020, may force auto makers to rethink their AWD strategy, General Motor Corp.’s Vice President-Global Product Development Bob Lutz told Ward’s last month. The ’08 Sebring outfitted with a 3.5L V-6 and AWD earns a U.S. Environmental Protection Agency city/highway rating of 15/24 mpg (16-10 L/100 km), while the front-wheel-drive version with the same engine achieves a thriftier 16/26 mpg rating (15-9 L/100 km). Suppliers are working on using lighter materials in their AWD offerings to save weight and lessen the impact on fuel economy, says Ericka Nielsen, BorgWarner’s marketing director. Cadiz says another reason for Chrysler’s decision to stop offering AWD in the Sebring and Avenger is the lack of demand by consumers shopping the midsize sedan segment. Price is another factor, as the FWD V-6 Sebring stickers at $27,105, while the AWD model is $29,105. The ’08 FWD Avenger R/T begins at $25,685, with AWD raising the price to $26,910. However, Ford Motor Co.’s midsize sedans continue to offer the option, which has drawn a healthy number of consumers. The AWD Ford Fusion and Mercury Milan see take rates of nearly 20% in some regions, Ford spokesman Alan Hall says. If take rates for any option fall below 5%-10%, it’s best to pull the plug, says Haig Stoddard, manager of North American light-vehicle forecasting at Global Insight. Through September, Sebring sedan sales tumbled 23.2% , compared with year-ago, to 41,660 units, while Avenger deliveries dropped 9.0% to 53,828, Ward’s data shows. Caliber sales were down 7.8% to 74,069.